Equine Photography is another specialty of ours and this page highlights some of our recent shoots in the San Francisco Bay Area. Some of the most amazing equine images are created when we show the special bond between you and your horse through photography. Horses are incredible animals and we love capturing the love and devotion you have for them. I have been a professional photographer in the San Francisco Bay Area for over 20 years and have been involved in many of the best aspects of photography in addition to weddings. We understand that Equine photography has its own special challenge and we have been meeting those challenges for many years. We promise that you will be pleased with the results. 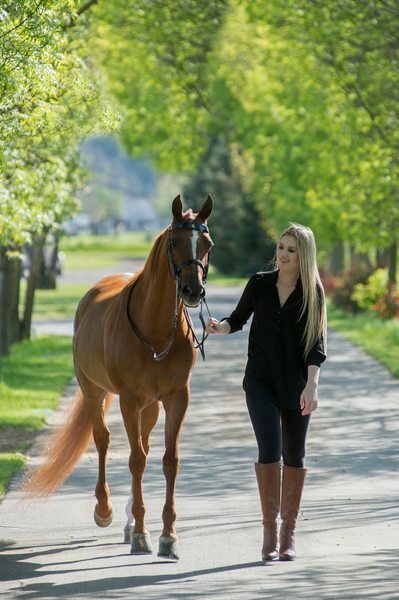 We are fully committed to making your Equine portrait session reflect your own personal style. We have always felt it is vital to discover what YOU want in your Horse Portrait session and then do our best to provide it to you! We have been doing this throughout the Northern California horse community for a long time. 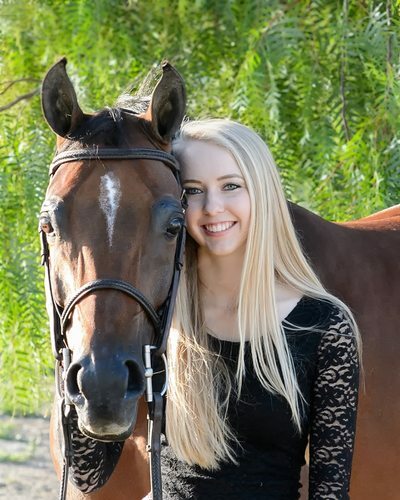 What better way to celebrate your graduation from high school then the incorporation of your horse into your memories. 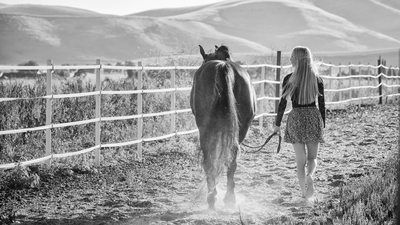 Growing up, horses were undoubtedly a big part of your life so it makes complete sense to highlight your senior portrait photography session with some images of you and your horse. We also include outdoor portraits of the High School Senior without the horse also, but usually do it in a stable setting or on the trail. 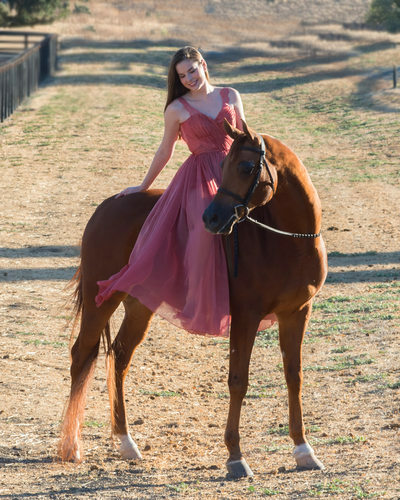 Your photography session will begin with portraits of you with your horse in a natural setting and then the horse is put away and we focus just on you. Please check out the gallery above to see samples of our High School Senior Portrait photography. 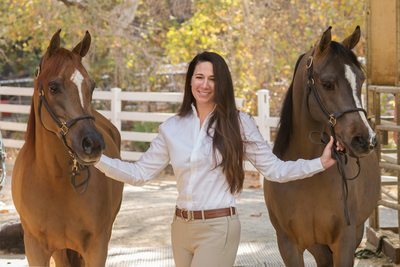 We service many of the typical Horse Communities locally including Clayton, Walnut Creek, Brentwood, Portola Valley, Danville and even Sacramento to name a few. 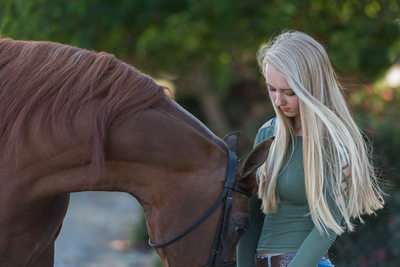 Most of our Senior Portrait / Equine sessions are done at your home barn and lasts about 2 hours. We try to do most of these portrait shoots in the late afternoon and early evening for the best and warmest light. The digital image files with full reproduction rights are available with your package to allow the High School senior to share her memories on Social media and with friends. For those of you with multiple horses, we can handle that too, just let us know in advance. We always want to provide our clients with affordable pricing for your horse/owner portrait shoot. To accomplish this we provide you with options for printing your photos or we can make you a beautiful wedding type album. Some of our equine owners want large wall portraits and we are happy to provide those as well. All of our packages include ALL of digital image files with full reproduction rights. This allows you to make your own prints and share the images on Social Media. Please contact us to receive your custom quote. Your portrait pricing will depend upon the location of your barn and the number of horses and/or length of the session needed. We want to provide you with timeless equine images in a beautiful outdoor setting. We will do some posed shots, but want to really focus on candid poses to help our clients relax and have fun! 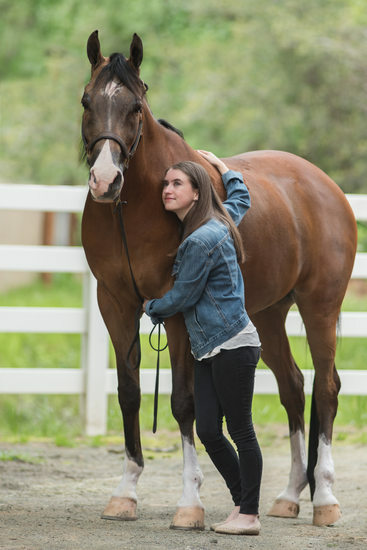 This documentary approach results in natural looking images of of you with your horse. 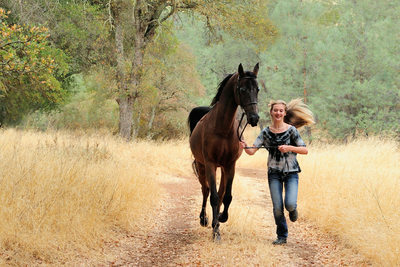 We will join you at your stable or horse trail location to do your custom equine portrait session. 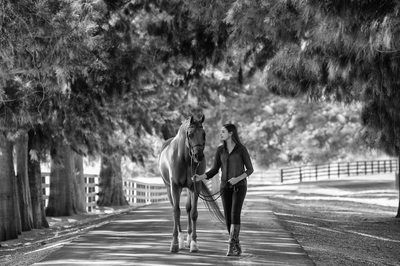 Included in your Equine Portrait session will be photos of you interacting with your horse and hand walking. If you want to try some riding shots, we can do that too! We will also want to know if you have any of your own ideas for the photo session which we will be happy to incorporate. Feel free to also take this opportunity to have some nice individual portraits taken of you with any background you want. We can also do them in your Northern California barn setting or similar outdoor location. We do not charge extra for this so it's like getting an additional portrait session for free! We are also a leading San Francisco Wedding Photographer with over 1,400 weddings creatively photographed. For more information check out our Home Page.